Rainbow Romance actor Lee Min Ki will be sharing screen space with My Father Is Strange actress Jung So Min in the upcoming Korean mini-series. 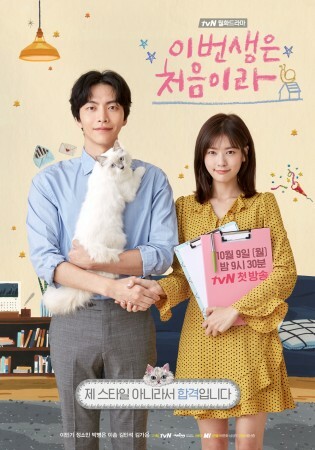 Because This Is My First Life, the upcoming tvN romantic comedy drama, known as This Life Is Our First, will feature Rainbow Romance actor Lee Min Ki and My Father Is Strange actress Jung So Min in lead roles. The Korean mini-series will feature Lee Min Ki's return to the small screen after 10 years. The 2007 KBS drama Four Gold Chasers was his last television project in lead roles. The 32-year-old actor made a guest appearance in the 2012 tvN drama Shut Up Flower Boy Band. In the upcoming tvN drama, Lee Min Ki will be portraying the role of a 38-year-old bachelor named Nam Se Hee. When the story begins, the character does not believe in a family life, but gradually he falls in love with a 30-year-old woman named Yoon Ji Ho. While sharing some details about his character, the Drama City actor admitted that he faced some challenges during the filming of a kiss scene with his co-star Jung So Min. "Our director told us that he doesn't usually spend this much time filming a kiss scene," Soompi quoted him. Explaining further, Jung So Min said, "Every time I film a first kiss scene [with a co-star], it's always at a point where we aren't very close yet so it's always very awkward. Since there's a kiss scene in the very first episode of the drama, it was pretty awkward to film." Other celebrities to appear in the Korean mini-series include White Christmas actress Esom, Queen of Mystery actor Park Byung Eun, Jackpot actress Kim Ga Eun and Defendant actor Kim Min Seok among others. Because This Is My First Life is written Yoon Nan Joong and directed by Park Joon Hwa. It is scheduled to premiere on tvN next Monday, October 2, at 9.30pm KST.